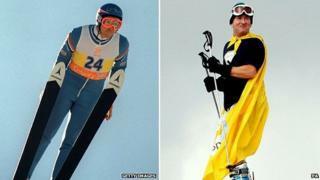 Britain's most famous ski jumper, Eddie "the Eagle" Edwards, has been warned a movie being made about his life is 90% "made up". The retired sportsman, who lives in Stroud, Gloucestershire, became a hero at the Calgary Winter Olympics in 1988 despite finishing a distant last. A film, starring Welsh actor Taron Egerton as Eddie, is currently being filmed and due for release next year. Edwards said: "I've been warned only 10 to 15% of it is based on my life." Edwards, 51, whose real first name is Michael, was working as a plasterer when he qualified, entirely self-funded, for the 1988 Winter Olympics ski-jumping competition. Despite finishing last in both the 70 metre and 90 metre events, he rapidly became a household name. "I was a normal guy, I just did the best I could with what I had - which wasn't much," he said. "I had no money, no training facilities, no snow, no ski jumps, no trainer but I still managed to ski jump for my country - and getting there was my gold medal." Since selling the rights to his story 17 years ago, several producers have tried to get the Olympian's life on the big screen. The latest to take on the biopic is Matthew Vaughn and his production company Marv Films, but Edwards thinks it will not be about his life "at all". "I've not really seen the script so I don't know what they've picked out of the things that happened in my life and what is made up," he said. "There's always a certain amount of it [poetic licence] but I'm kind of anxious - what exactly have they put in about my life and how have they portrayed me."